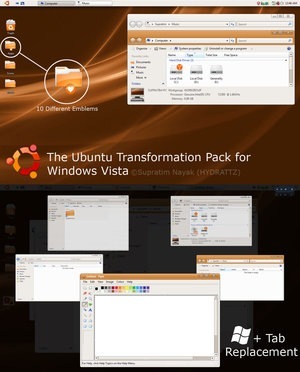 If you are on Vista and want to have the look and feel of Ubuntu, then you could try Ubuntu transformation Pack which transform your Windows Vista interface to the interface of ubuntu.The transformation pack is available for Vista SP1 users as well. 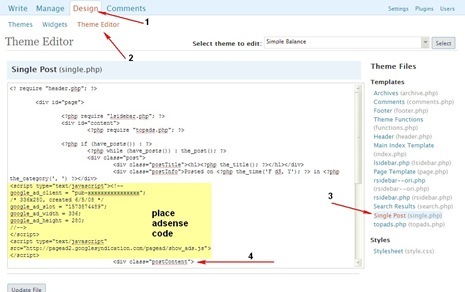 make backup of the original files before copying these.Remember, you should have administrative rights. 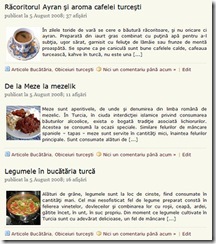 Create a restore point before installing these. Do this in SAFE MODE(but for a safer result). For SP1 users check out the readme.txt file inside the archive for how to install on Vista SP1. 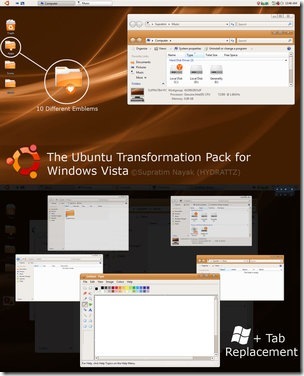 The Best Transformation of XP into Ubuntu is Given By Rajesh Patel of “Tweaking Windows”. He is the Best that All.